Technology Credit Union has repositioned its balance sheet to prepare for today’s rate environment. Consumers expect deposit rates to raise, but loan rates aren’t as easily budged. In anticipation of higher deposit rates, Technology Credit Union has repositioned its balance sheet. For the past decade, the Federal Funds Rate has hovered at or near 0%. This is the lowest rate in the history of the Federal Reserve and is the result of the central bank’s efforts to encourage spending, borrowing, and investment to bring the United States out of the Great Recession. Consequently, borrowers have enjoyed an unprecedented run of low loan rates. “Consumers have grown accustomed to really low mortgage rates, auto loan rates, and credit card rates,” says Todd Harris, CEO of Technology Credit Union ($2.6B, San Jose, CA). The Fed has been tightening its monetary policy — raising the Federal Funds Rate to 2.00% in a little over two years — and unwinding its quantitative easing program. The result? Decreased market liquidity and increased competition for deposits. The Federal Funds Rate remained historically low in the aftermath of the Great Recession. A new Fed policy has set a target rate of 3.50% by 2020.
Credit unions typically set loan and deposit rates based on the U.S. Treasury’s yield curve (see chart below). The rates on the short end of the Treasury’s yield curve have risen with the Fed Funds Rate. However, longer-term rates have not risen at the same pace, creating a flatter yield curve, most commonly expressed by calculating the difference between the 2-year and 10-year Treasury notes. The three-month daily yield curve rate has increased 148 basis points since late December 2016. During the same time, the 10-year has moved 53 basis points. This presents a challenge, especially when members expect deposit rates to increase in step with Fed rates. “If you don’t have loan rates going up, it makes it harder to afford deposit rates going up,” Harris says. What’s more, those institutions that do move loan rates risk losing business to those that don’t. Technology Credit Union has been prepping for this rising rate environment for the past half-decade. According to Harris, it has prepared its balance sheet to absorb higher product rates by diversifying its product set and adding more variably priced loans. The goal? To become an attractive financial services provider in a fast-changing landscape. The Silicon Valley credit union’s balance sheet has changed significantly in the past few years. In first quarter 2014, the credit union held 52.7% of its mortgages in a fixed-rate product. Today, that figure has fallen to 24.2%. 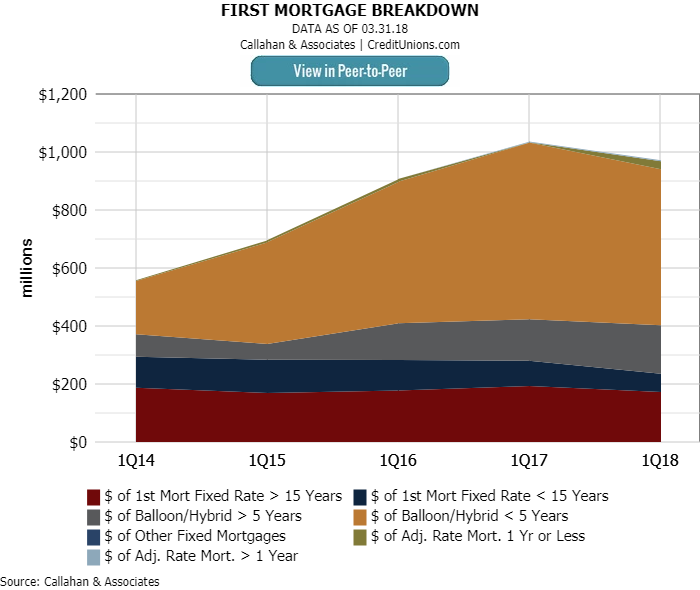 Conversely, balloon/hybrid mortgages now comprise 72.6% of its mortgage portfolio. In 2014, balloon/hybrid loans were one part of Technology’s mortgage portfolio. Today, they comprise the clear majority. Over this same period, the credit union has focused on auto loans — a short-term product that re-prices relatively quickly while still generating interest income — and solar loans. “Solar loans are fixed-rate products, but they’re priced well,” Harris says. According to the CEO, rates for Technology Credit Union’s solar loans vary between 2.99% and 5.99%, and the yields are typically higher than an auto loan. There’s more credit risk in solar, but the credit union has structured the loans well in the event of an economic downturn. 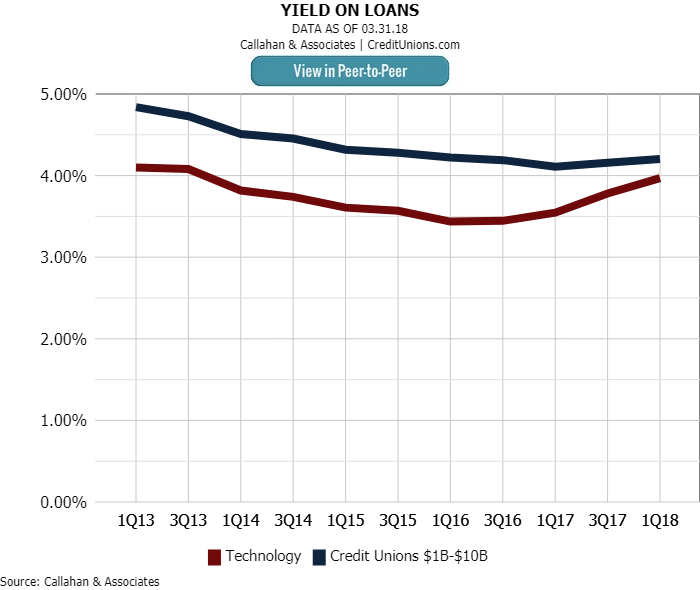 As Technology Credit Union began to reposition its balance sheet to focus on shorter-term and higher yielding loan products, its loan yield grew by 53 basis points from first quarter 2016 to first quarter 2018. Over that same period, loan yields at credit unions with assets from $1 billion-$10 billion declined by 2 basis points. Repositioning its balance sheet toward more frequent repricing and higher-yielding asset classes allowed the credit union to raise its deposit rates in late 2017 and early 2018. But not before conducting its due diligence. In late 2017, the credit union survey local competitors to get a sense of the rate environment before raising rates on both maturity and non-maturity accounts. “Some moved as quickly as we did, but no one has moved further,” Harris says. To wit, the credit union’s cost of funds has nearly tripled in the past four years, from 0.20% to 0.56%, coinciding with its higher deposit rates. Over the same period, the cost of funds at California credit unions has increased 18 basis points. 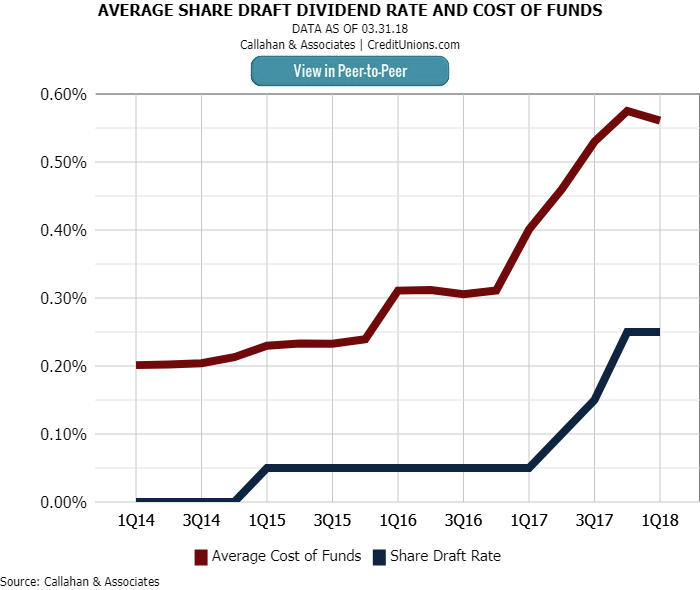 Technology Credit Union’s cost of funds, the interest rate paid on funds deployed, has nearly tripled since 2014, commiserate with an uptick in the credit union’s deposit rates. Raising its rates and reevaluating its product mix seems to be helping the credit union meet its goal: becoming a more attractive financial services provider in its competitive market. As of first quarter, Technology Credit Union ranked at No. 7 in member growth and No. 80 in deposit growth among the nation’s 288 credit unions with more than $1 billion in assets. Additionally, the credit union’s net interest margin has trended up from 2.36% in the first quarter of 2014 to 2.89% in the first quarter of 2018. Small steps taken by the credit union have resulted in big gains. An increase in mortgage interest rates will not have the same effect on the Silicon Valley housing market as the rest of the country. That's the prediction from Todd Harris, CEO of Technology Credit Union. An increase in mortgage rates results in an increase in the monthly payment. The monthly payment, in turn, affects the affordability of housing. In a market where there are as many homes for sale as there are people buying them, that causes a slowdown in the housing market. It takes several months for the market to adjust, Harris says, and housing prices move down accordingly. In Silicon Valley, however, housing demand is much greater than supply. That's why Harris doesn’t expect rising rates to push down the value of homes in his market.